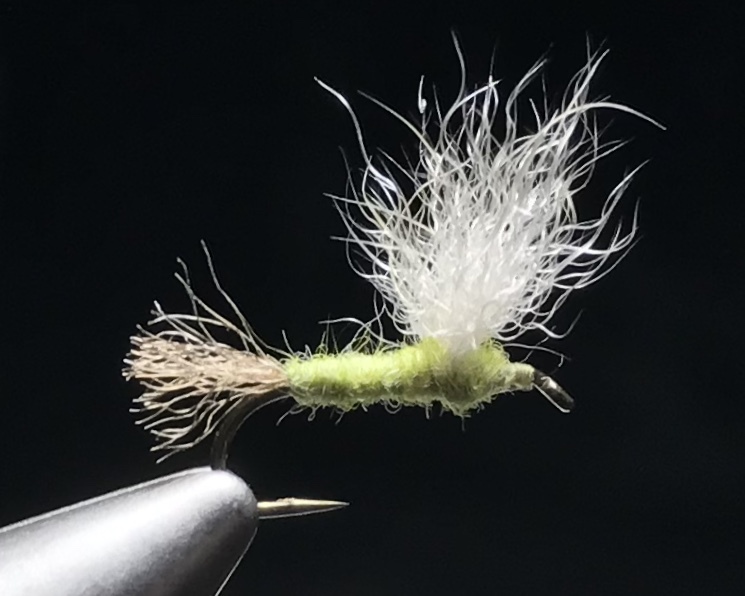 We Won't Be Fishing...Again, But We Still Can Tie Flies. 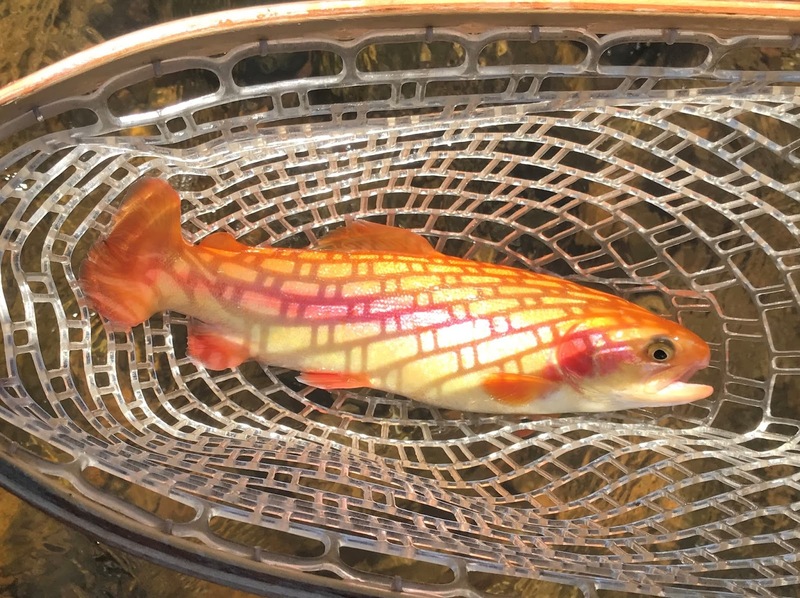 This has been the story of our Autumn fishing in the Northeast this year. It seems like every weekend we have gotten blown out by late week rains and this weekend is no exception. 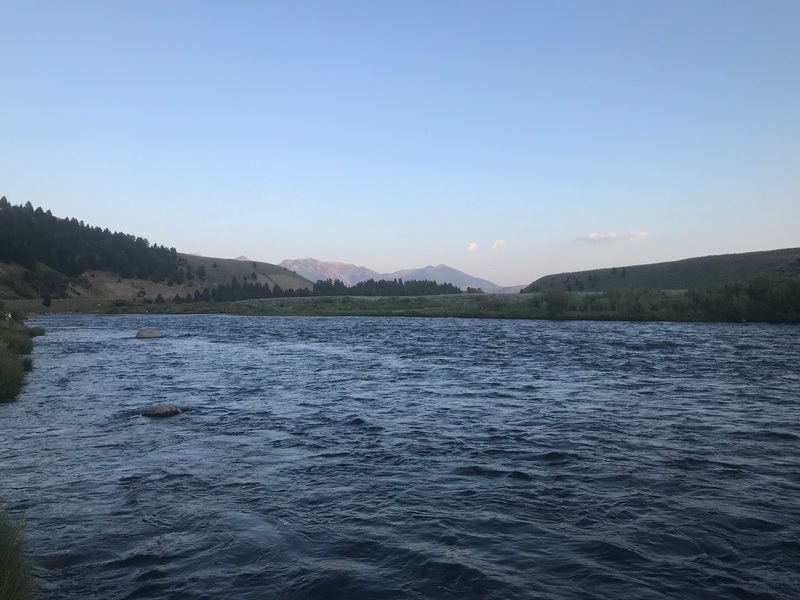 Of course, last weekend when we couldn't find the time to fish, the river was in good shape. 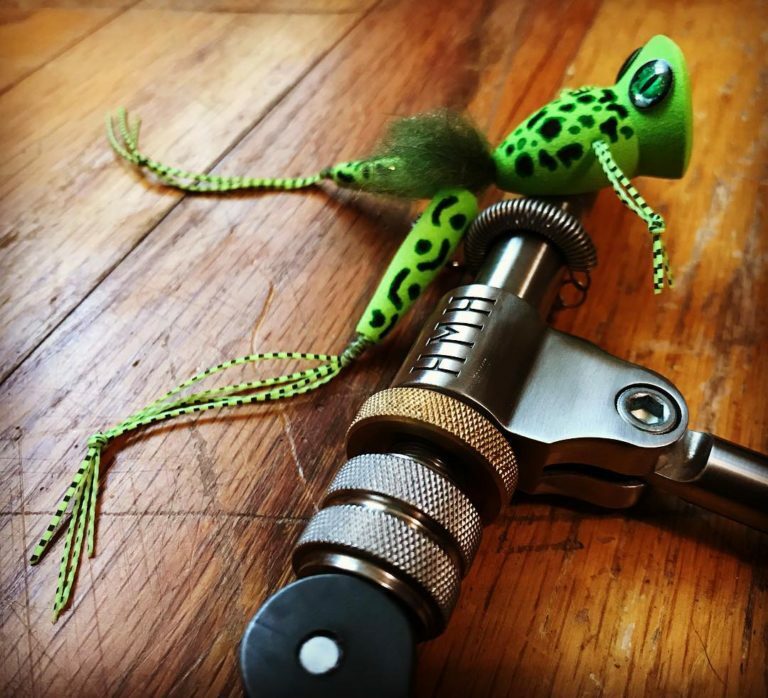 This weekend you can always head to Shannon's Fly Shop in Califon, NJ and have some fun tying flies. 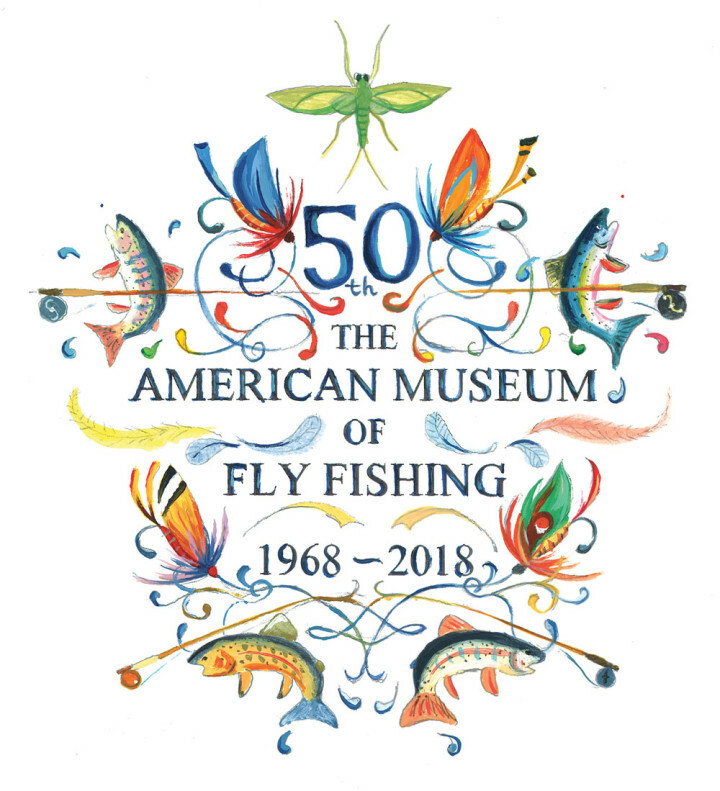 On Saturday morning Len Ruggia will be instructing the beginner's fly tying class at 9:30AM. 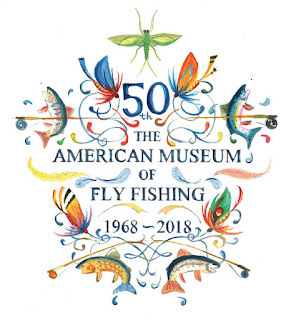 And on Sunday at 9:30AM, Tim Flagler will be there demonstrating how he ties some of his favorite flies. 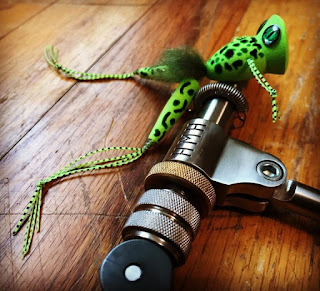 Both of these classes are free to all - just bring your vise and tying tools. 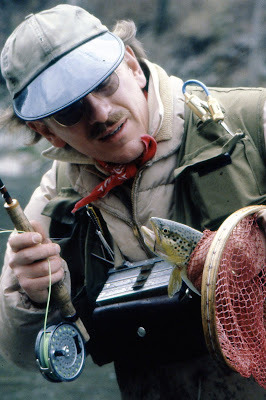 Charlie was a noted author and fly fishing expert. 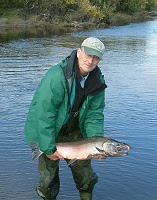 He wrote 15 books on fly fishing, as well as numerous magazine articles. 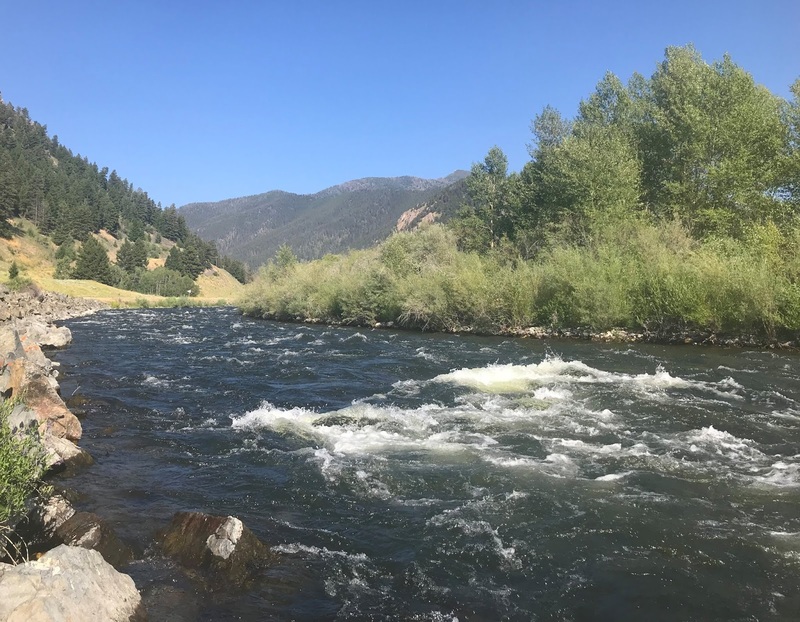 He loved teaching others the sport of fly fishing and the appreciation of the beauty of the natural world. 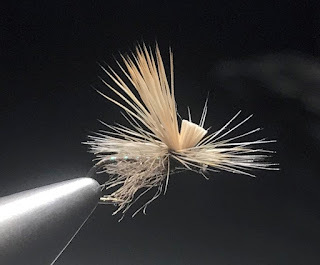 Here's a link to a recent Fly Fisherman Magazine article by Mike Mercer on the Missing Link caddis as a follow up to my last post; thanks to an unknown reader. 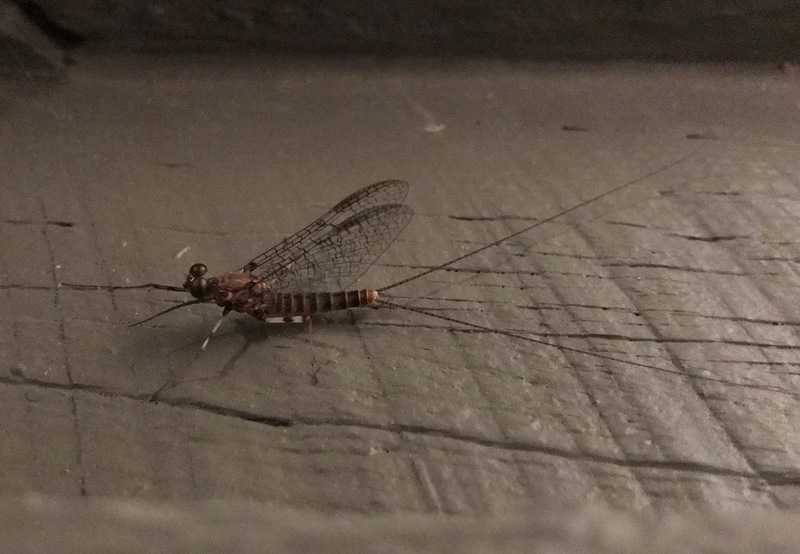 The Green Drake, or the Ephemera danica, is the largest mayfly in Sweden. 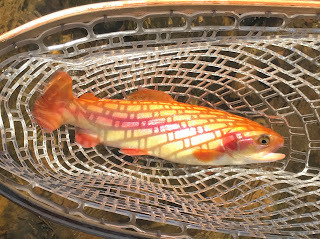 When it hatches, a short period in late May to early June, the trout goes crazy. 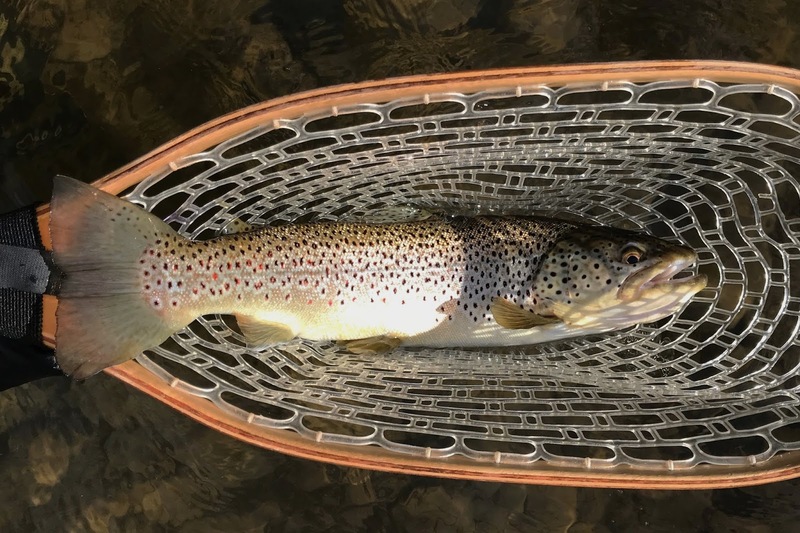 Even the biggest trout come out and feed on the juicy insects, and when that happens the fly fisherman should be on the river bank. It has been many years since I first went to Montana for the first time with a good friend, Don, to fish the Madison River and the surrounding trout waters, and I still get just as excited today as I did then. This year I'm going with the usual crowd, albeit without my son and a couple of the others. We going to be spending half the trip on the Madison River, and the other half up on the Missouri River. 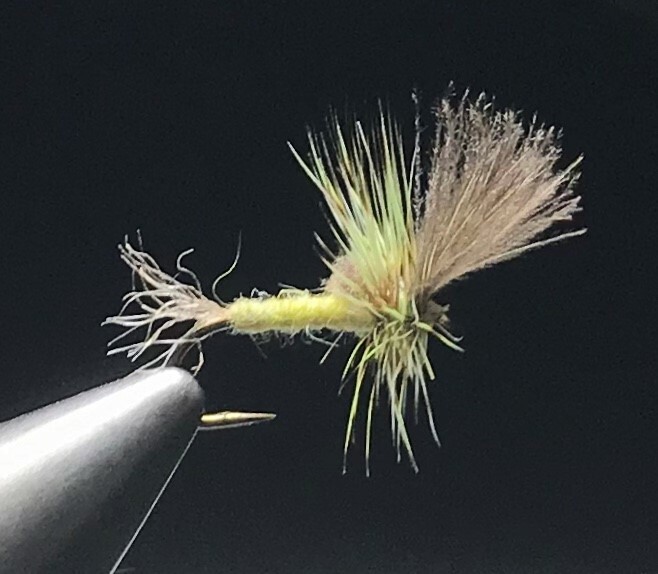 In preparation, I'm tying all the flies I typically use when on those waters in late July. 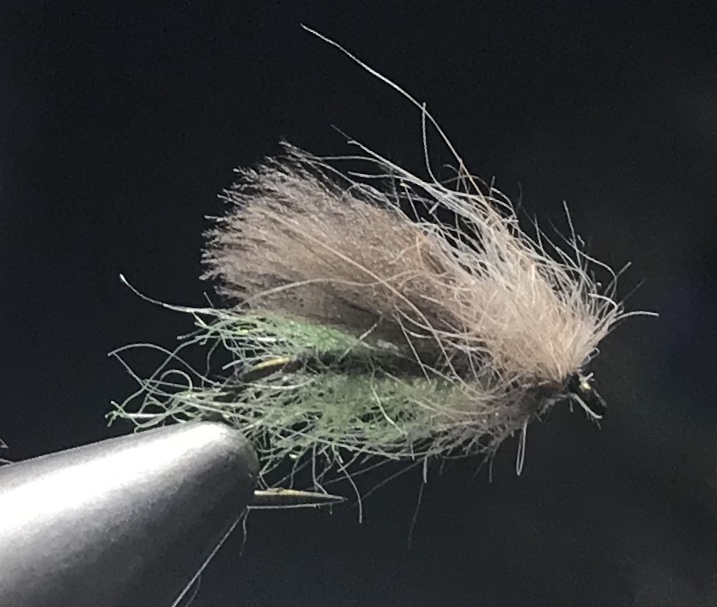 Here's my Sawyer's Pheasant Tail nymph. 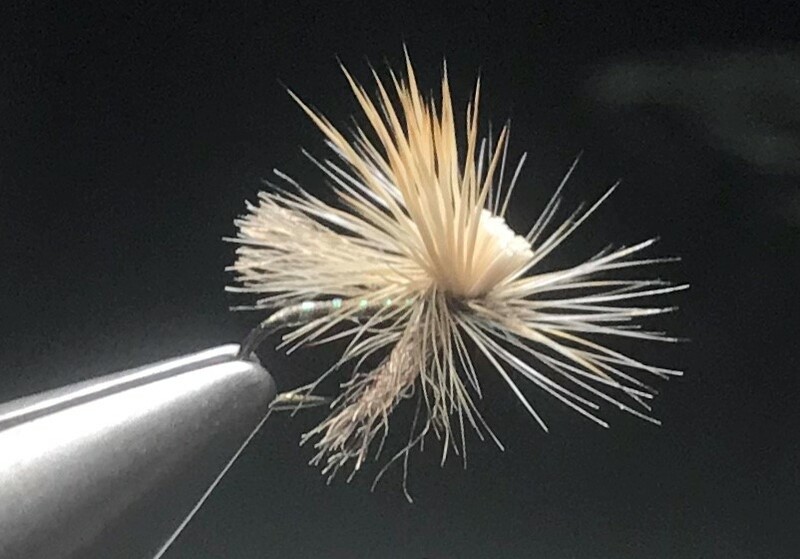 For me, this is a must have fly as it aptly imitates the PMD nymphs so common and available just about anywhere in Montana in July. I typically fish it by itself on the end of a long leader casting it straight upstream at the heads of pools and in the riffles; depending on the water depth and speed, I may put a split shot or two on the leader above it. It works great. 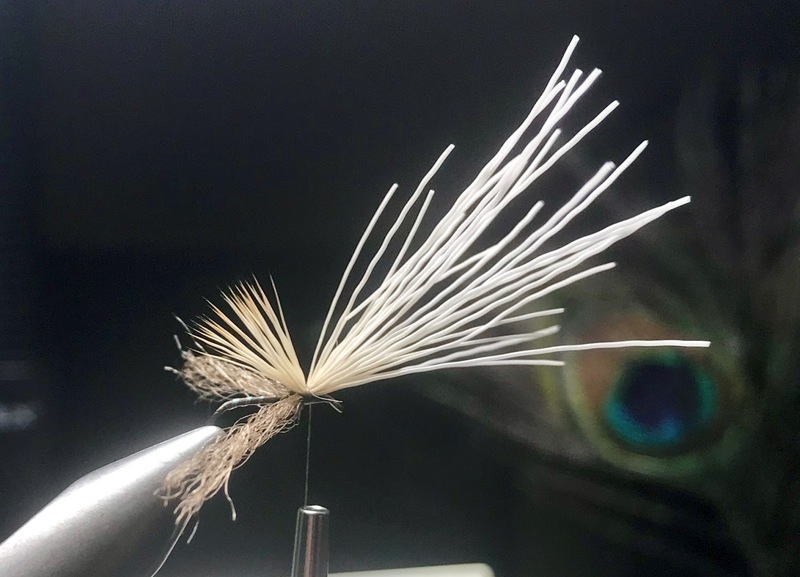 This is Kelly Galloup's Improved Blue-winged Olive nymph, which is a variation on the Sawyer Pheasant Tail nymph. It has a peacock herl thorax and gills of a white, sparse dubbing material. I used Senyo's Laser Dub here. 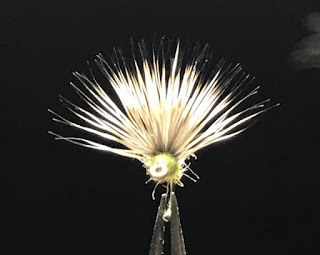 This fly has been very effective for me the last few years both here in the East and in Montana. Here's the Iris Caddis, which as you may know is one of my very favorite patterns. 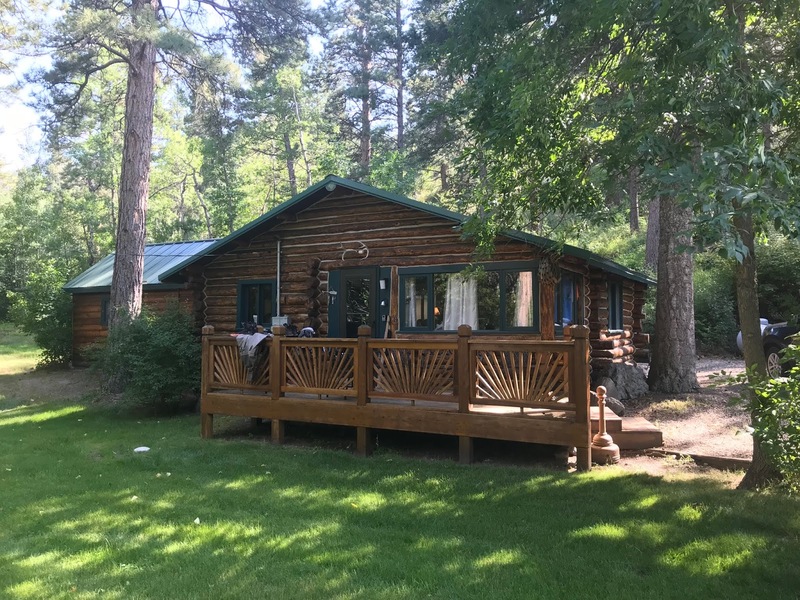 It was introduced to me that first year I went to Montana by Don, and like many of you, it took a few years for me to recognize its full potential. 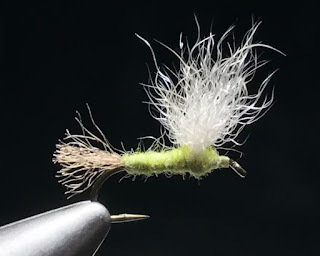 I tied the thorax with touch-dubbed hare's mask, but the original is tied with the hare's mask just dubbed on the thread. 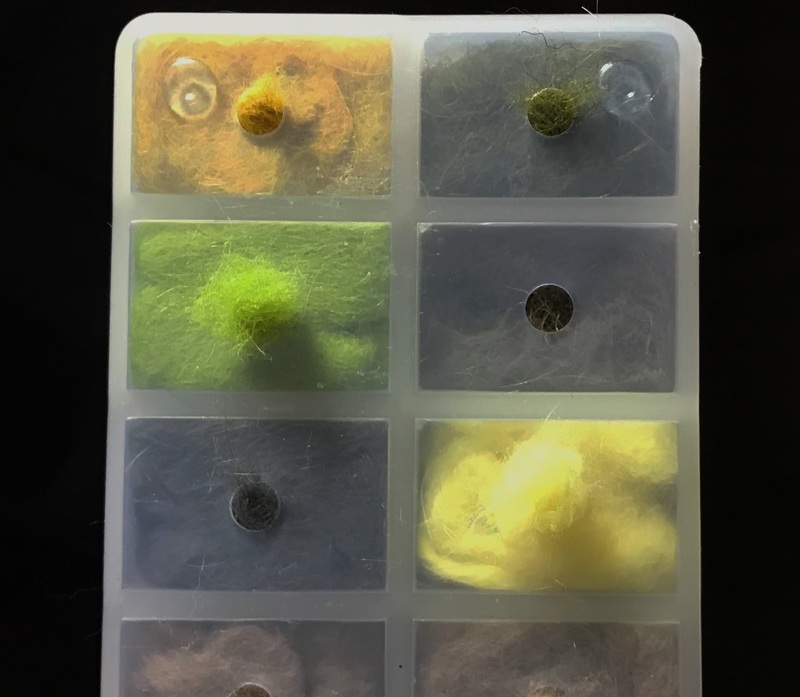 I like the touch-dub method because it give the fly a buggier look and the wax helps improve the way the fly floats without the use of floatant. Here's a Pale Morning Dun snowshoe rabbit dry. 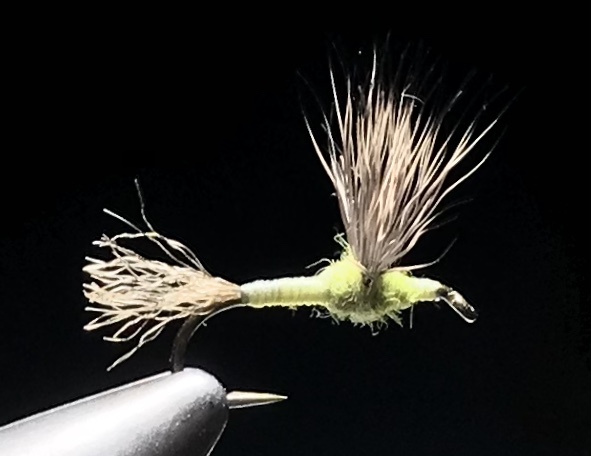 The body here is dubbed with a mixture of yellow and light olive beaver fur mixed 50/50. The lighting in the photo makes it appear bright yellow/olive, but its really a paler yellow/olive. I like beaver because its a natural fur that holds its color very well even when wet. Here's a PMD sparkle dun side and front view. 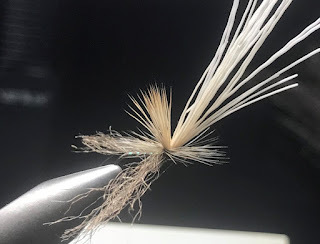 Make sure you are using a high quality deer comparadun hair for the wing - short black intact tips like you see in the front view. If the hair tips are broken or long, don't use it, it is likely dried out and brittle or won't float very well. Front view of PMD sparkle dun. 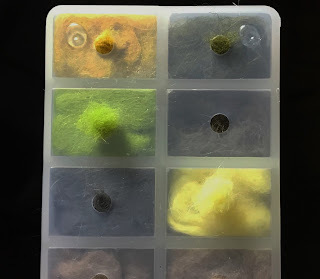 Here's a fairly good photo of the colors I mix for the PMD dun for reference. 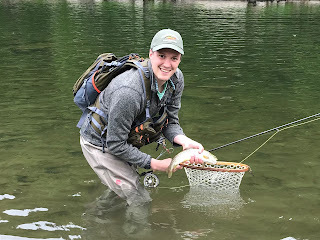 I had an early Father's Day last weekend with my son, Hunt, who came down from Boston to fish with me and some of our friends in the Catskills. Hunt worked until 5 before driving down so Friday evening I fished with Steve on the East Branch of the Delaware River. It was a beautiful time to be on the river with barely a breeze, warm at first, and clear. As the dusk settled in, the air cooled and sulphurs, isonychias, gray fox, green drakes and caddis hatched sporadically but the fish didn't cooperate beyond a bunch of one-and-done rises that were little more than a tease. When the sun dropped below the mountains, the sky above us filled with march brown spinners. The spinners hadn't dropped to the water by the time darkness set in so we packed it in and went to get some dinner and get back to the cabin before Hunt arrived. 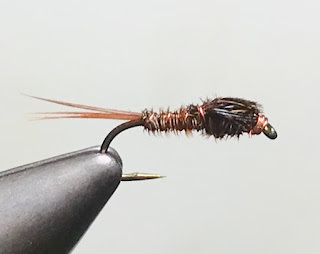 Here's a march brown spinners that greeted us under the cabin lights. Check out the length of those tails! We were also greeted by this giant cream pattern-wing sedge - Hydatophylax sp. 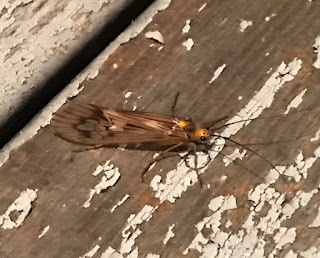 These are very large caddisflies - this one is a good 1.5 inches long! Over 2" including antennae. 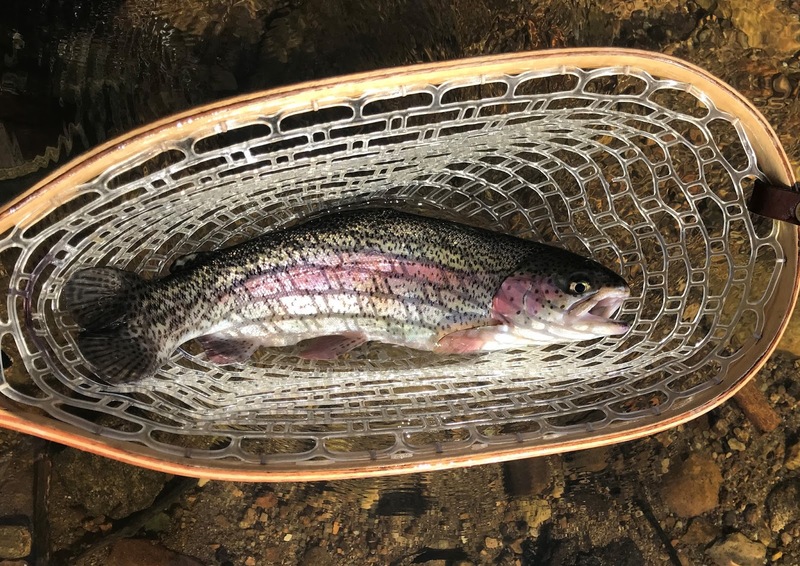 Saturday we fished in the morning hitting many pools on the Beaverkill, but the bugs were sparse and with that very few fish were rising. Being June, we had no interest in fishing nymphs so by early afternoon we called it quits and went back to the cabin to tie some flies for the evening and catch up with Hunt on the last few months in Boston and his new job. 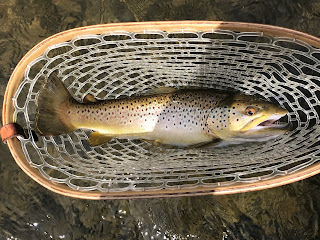 Saturday evening the bugs really didn't get going until dusk, but when they did the fish responded and we took a few nice browns on Iris Caddis fished in the film. On Sunday morning we fished a bugless Beavekill. We hit a bunch of pools and all were pretty quiet. We saw very few anglers as a result. 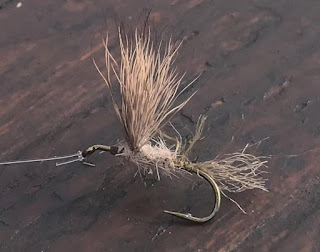 In the early afternoon though, we noticed a couple of fish working right off the far bank of a wide, flat pool and Hunt decided to see if he could reach them with a biot body/cdc wing cornuta spinner. He worked hard, making 50' + casts, and over about 20 minutes or so managed to get a couple of soft takes but no hook ups. Determined, he changed position to get above the fish a little more and after a short while he got a solid hook up that he brought to net to finish up a great weekend. The only thing missing were Hunt's two sisters, Megan and Leigh, who are always with us in spirit when we fish. 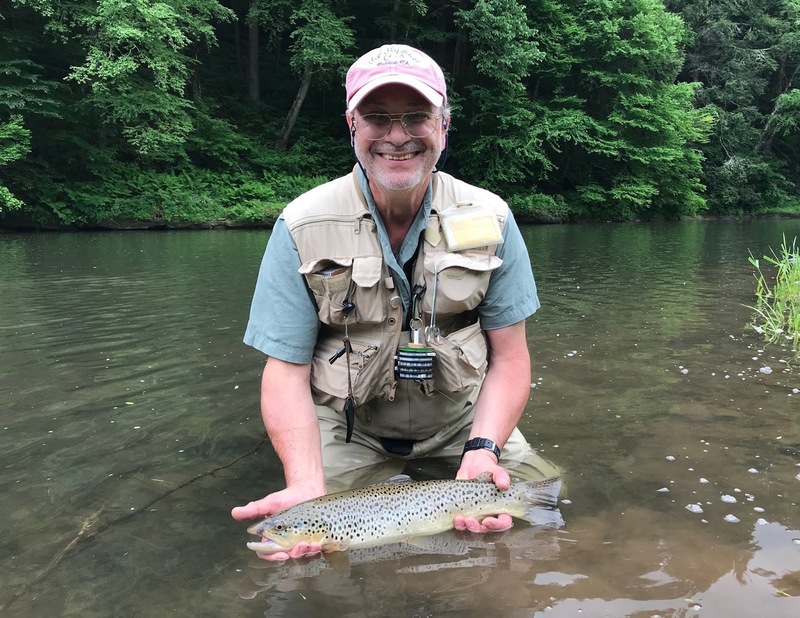 It's hatch time all over the Northeast and our buddy Vinnie got in on the action Saturday catching a couple of nice browns on a green drake emerger while fishing the Upper Delaware River system. 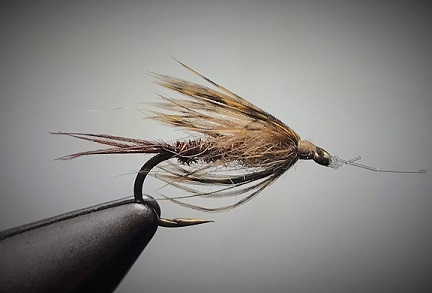 Sorry for the lack of posts here in recent weeks - lots of working, fishing, social crap and tying, but not much time for blogging, although I'd rather be writing than doing the social thing. Not that I don't like people, I just prefer them in small quantities and doses. And besides, I would much rather listen to the chatter of the birds mixed with the sounds of the river with no one in sight. Locally, things have warmed up nicely and the rivers are at good levels and clear. The sulphurs have been hatching great this past week with evening spinner falls that rival those of memories past. There are also good numbers of caddis about, including the egg laying grannoms mixed in with the sulphurs at dusk. Most of the sulphurs are a size 16 and and 18, with some of the larger size 14 mixed in. Here's a great shot of an orange sulphur or pink lady, Epeorus vitreus taken by our friend John Collins, aka Electric Tyer. This fly looks very much like the pink cahill (Stenacron interpunctatum) that also hatches around now, both a size #14, but with the cahill the fore-wings have distinct dark markings/mottling along the forward edge, and the wings have a pale creamy-yellow cast to them. 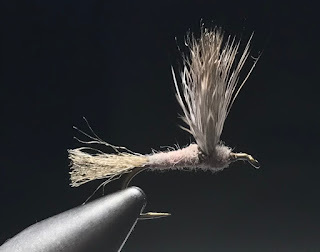 For the angler, the pink cahill covers both flies nicely. 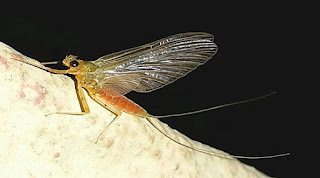 During the day the sulphur nymphs are very active before they begin hatching and fishing a pheasant tail nymph or sulphur nymph can be very productive before hatching begins typically in the early evening. With all the different caddis hatching right now, an iris caddis fished wet during the day, and as a dry in the film in the evening if nothing else is hatching, can also be very effective. This fly has become one of my most productive flies over the years fished wet or dry. I highly recommend it. 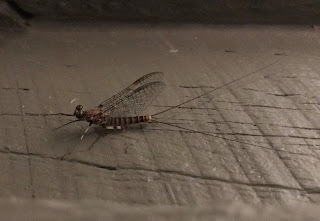 Up in the Catskills and in the Poconos, the rivers are fairly high but clear with all kinds of bugs hatching. The march browns are showing along with the ever present blue-winged olives, particularly on overcast or showery days. The little dark grannoms (#18) and the lighter of the species, the apple caddis, have been hatching well. 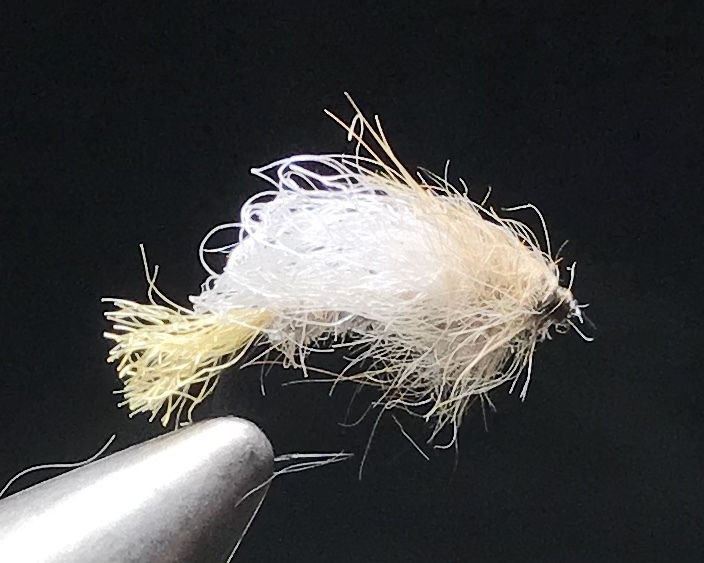 Lighter tan caddis (#14-16) are also about in good numbers. 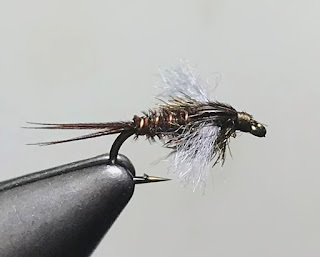 In the evening be prepared with some egg laying caddis near dusk as some evenings the fish will take them over all the other bugs floating over their heads. 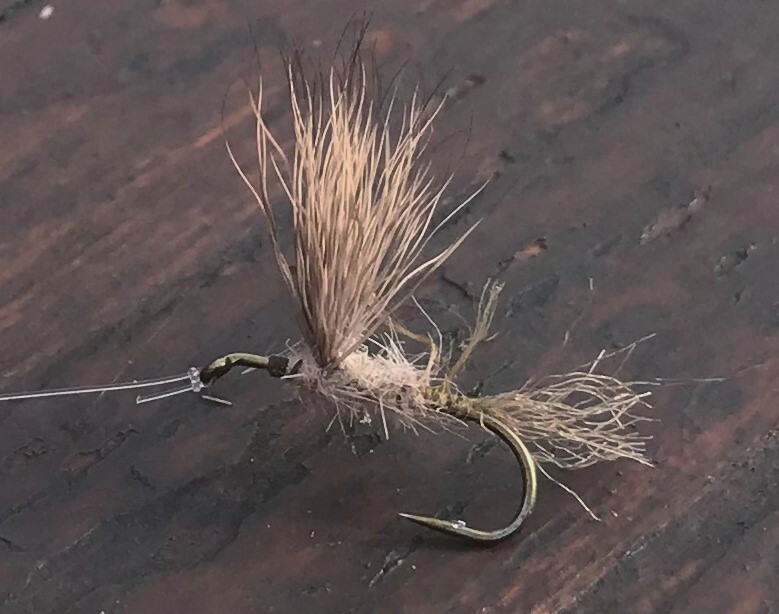 AND if you are on any river in the region make sure you have rusty spinners in #12-16 as there have been lots of them showing on the calmer evenings. The walk to a lesser known pool in the Catskills in a soft rain. 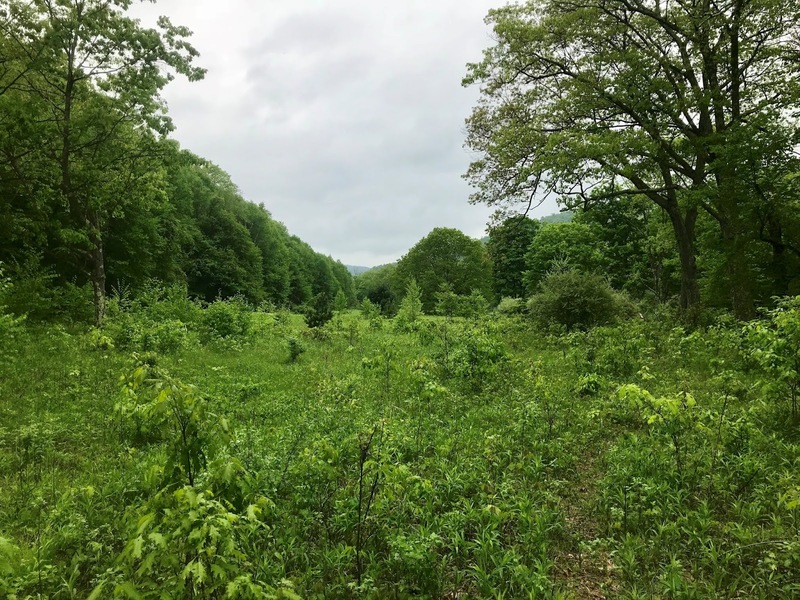 This past Friday afternoon my friend Paul and I headed up to Roscoe, NY to meet up with a few other friends and get in a few days fishing the Hendrickson hatch. When we got to the Beaverkill River late in the afternoon the bugs had stopped hatching and the wind was kicking up. The guys that got there earlier said the hatch was good but the fish weren't looking up. With the wind blowing fairly hard and nothing on the water, we wound up hanging out at the truck with the others catching up and sipping a beer. We never got geared up; the water surface was rippled from the wind and after an hour or so we didn't see a single bug or rise. By the time we got dinner it was just getting dark and a wicked storm moved through with high winds blowing the rain sideways. 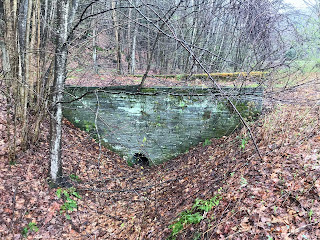 Beaverkill cut stone culvert along the old railroad bed. Saturday morning arrived with bright sun and cool temperatures. A few high clouds drifted by casting shadows that moved across the tops of the bare trees lining the hillsides along the river corridor. 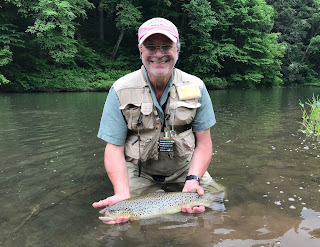 After a hearty breakfast, the 8 of us split up; a few guys took the drift boat to float the Delaware, two went to wade fish the West Branch of the Delaware; and Paul, Steve and I stayed on the Beaverkill hoping to hit the Hendrickson hatch that afternoon. 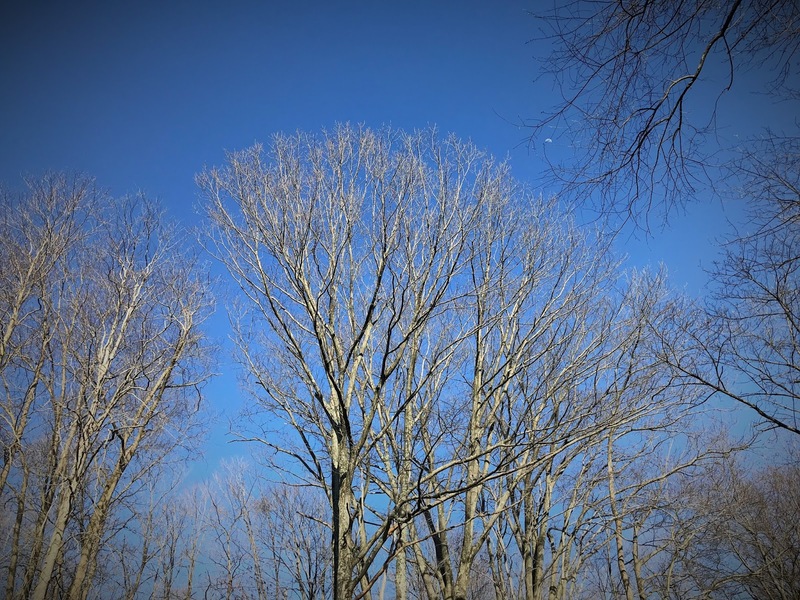 As the day turned from morning to afternoon, the bright sun was muted by high thin clouds and the air warmed to comfortable temps. 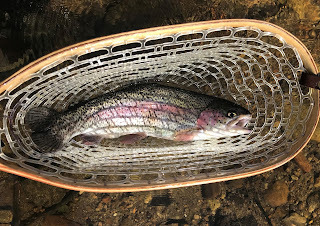 Around 2:00 PM a few olives and blue quills hatched but the trout laid low, ignoring the surface and ignoring our subsurface efforts as well. 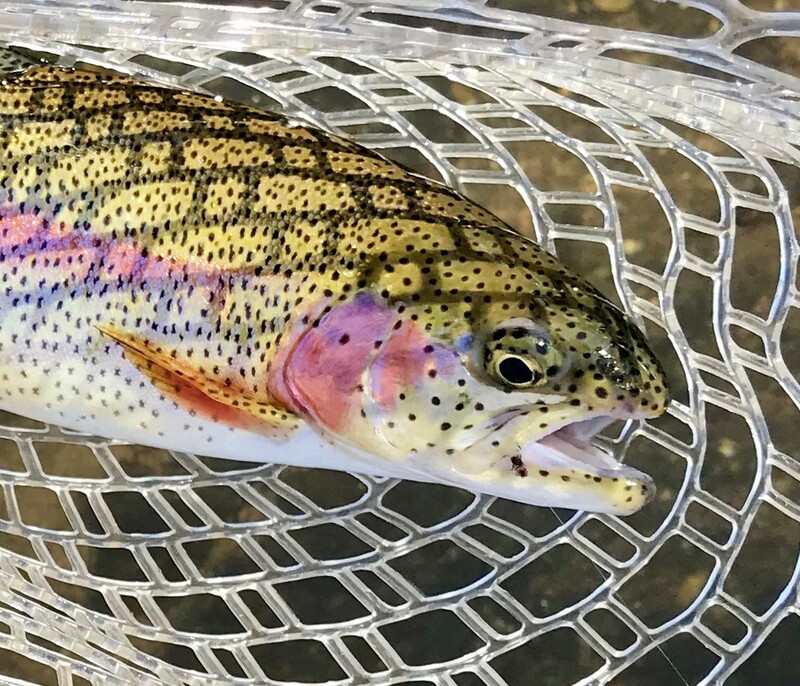 I did hook a nice rainbow on a baetis nymph, but after a brief tussle my tippet separated from the my leader setting the fish free except for the fly in its jaw and a thin wisp of monofilament that hopefully with come free in short order. Around 2:30 or so the hendricksons and red quills started to hatch along with blue quills, dark grannoms and a few quill gordons. By 3:00 there were quite a few flies on the water which brought a few trout up, but surprisingly most came up only once and then didn't show again. This went on for a while so finding a target wasn't easy. Then like someone flipped a switch just after 4:00, quite a few fish began rising steadily. 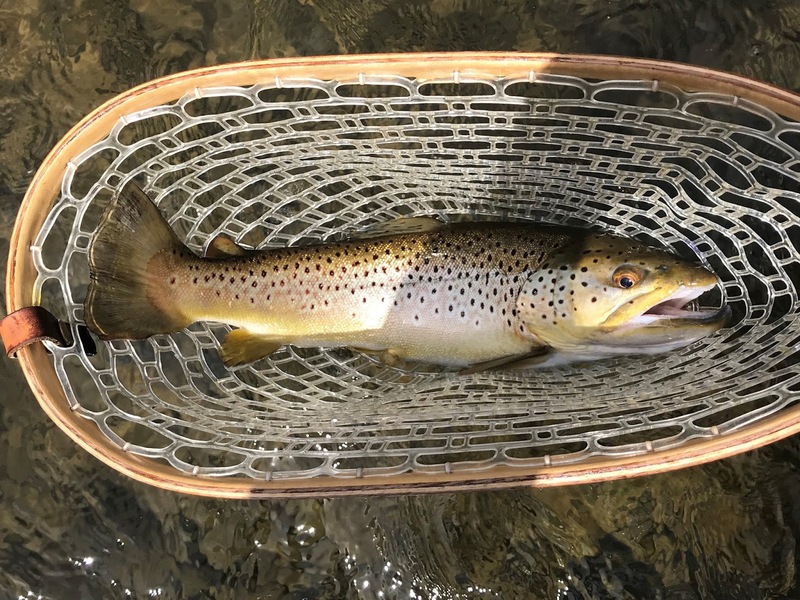 I picked out what appeared to be a nice brown that was taking hendricksons in a slick alongside a large submerged boulder and after a few casts got a good drift and the fish sipped in the hendrickson sparkle dun like it was one of the naturals. 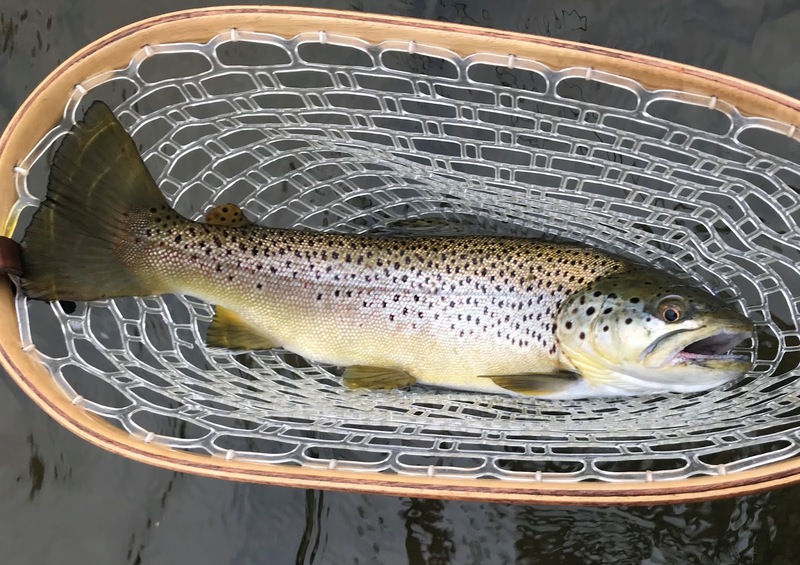 The hook-jawed brown fought hard and didn't come to net without a few good runs that made my drag sing. 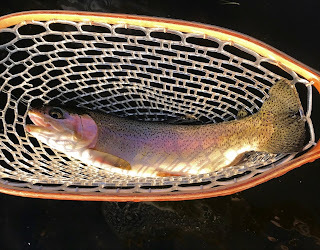 The hatch continued and the fish kept rising. Over the 45 minutes I took another five browns on the same hendrickson sparkle dun that took the first one. One of the fish was a little bigger than the first while the others were around 14 inches or so. And then just as quickly as the feeding started it stopped just as suddenly a little before five o'clock. The insect kept hatching, but the fish made other plans leaving us to scratch our heads wondering what just happened. 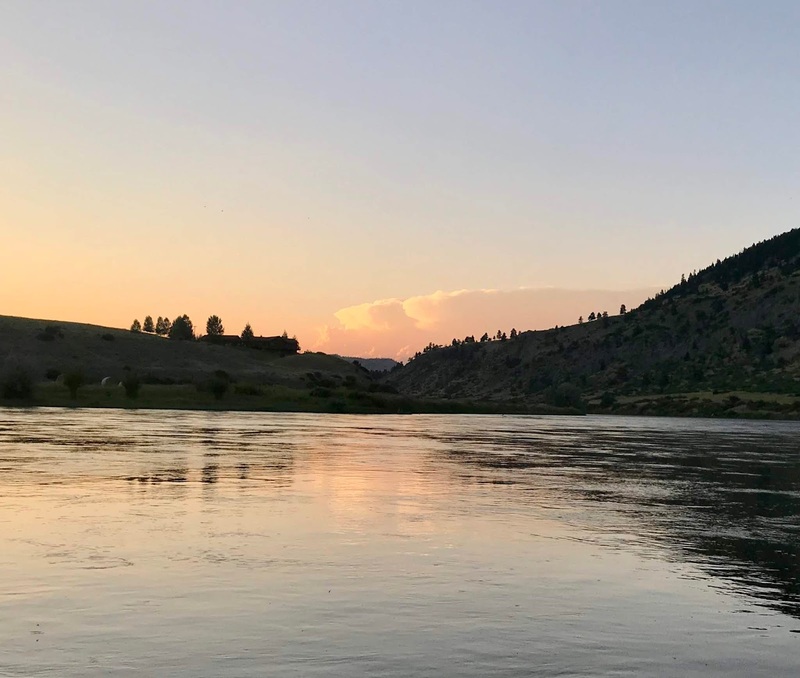 The weather didn't change, the river didn't appear to have changed, but something made the fish change their behavior despite plenty of food in and on the water. We stayed on the water for another hour hoping things would turn back on, but that wasn't to be so we packed it in and got some dinner. Here's a hendrickson sparkle dun before and after the fish got done with it. There's nothing like a well-chewed fly. Sunday morning arrived like no other day we have had so far this year. 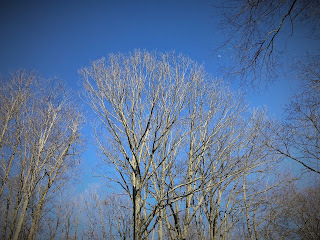 It was warm, the cloudless sky was deep blue, and the air had the unmistakable smell of fresh blooms and trees beginning to bud. Daffodils, tulips and forsythia were in full flower while robins, cardinals and other songbirds brought their chorus to the proceedings. Even better, we met my son Matt and his girlfriend Kelly for brunch and spent a couple of hours catching up and hearing about his new life in Boston. 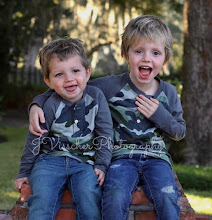 It was a wonderful time, too short, but they had a long drive home and he had to go to work at 2:00AM. Fast forward to mid-afternoon Sunday. When I got to the river around 3:00 PM, the sun was bright through a cloudless sky and a light breeze cooled the warm air. 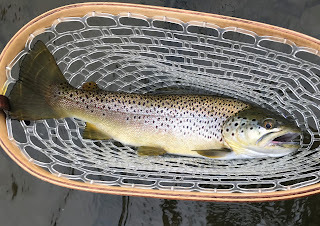 The water was near perfect; clear with a strong spring flow, and in the low 50's F. I was a little hyped up after seeing all those hendricksons the day before on the river, and the kid in me was enjoying every moment. After rigging up my rod, I sat on the bank and watched the water for bugs and risers while I peeled and ate a clementine. The river was quiet, but it was still early, and my expectations were high. After a short while of watching and not seeing anything on the water, I tied a #12 soft hackle pheasant tail to the end of my 5X tippet and added some shot about 8" above the fly - this is my go-to hendrickson emerger. I waded out and began dead drifting the fly up and across before letting it swing below me in the current so it would rise to the surface as the line tightened. After a few casts I stepped upstream some and cast above a seam on the far side of the river. It took a few drifts to get the fly to drop into the pocket, but once I figured it out I took two stocked rainbows a few minutes apart. One of the fish I thought was a koi at first, but it was this mutant instead. As the time passed I began to notice some hendricksons drifting my me as well as some dark grannoms in the air. Nothing rose to the hendricksons despite what seemed to me to be perfect conditions. 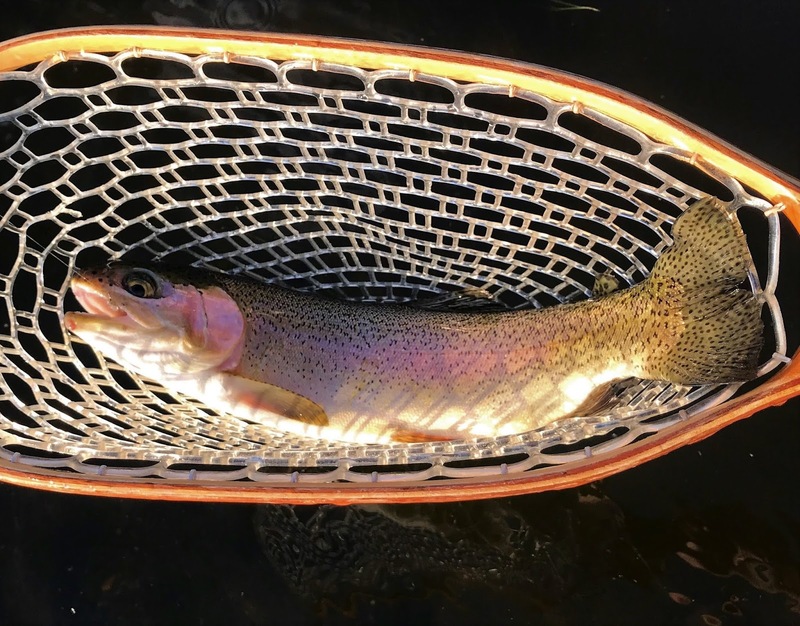 The insects were riding the water surface for long periods before taking flight giving the trout plenty of time to rise up and sip the in. I didn't see a single rise though in the first hour or so of fishing. 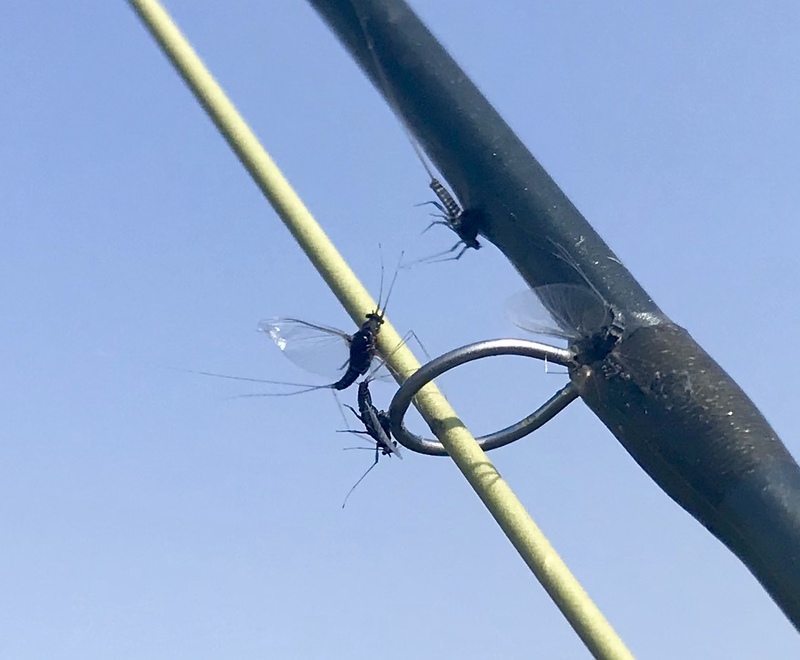 Experience has taught me that often when flies are the water and trout are not rising to them in one stretch, another stretch may have actively feeding fish. So I climbed the bank and walked upstream through the brush and over dead falls to a couple of pools that I thought might have some action. When I got to the edge of the water I stood and watched the water in the pool in front of me, and the lower end of the one above. After a few minutes, a trout rose in the tail of the pool above where I was right where the water transitions into the pool I was standing next to. 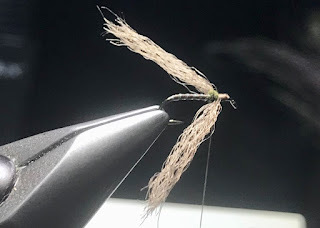 A short count later it rose again, so I took the shot of my leader, checked my knot at the fly and made sure the hook point was sharp before slowly stepping up the bank to where I could get a good cast above the target. This fish was hungry. My first cast landed about 2 feet above the fish and it didn't hesitate. 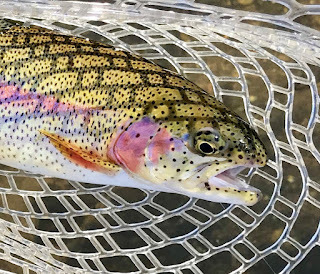 It moved to the fly and took it in a splashy rise, I lifted the rod, and was tight to what turned out to be a nice rainbow trout. Over the next hour and a half hendricksons hatched sporadically and those that took their time getting off the water where summarily taken from below. 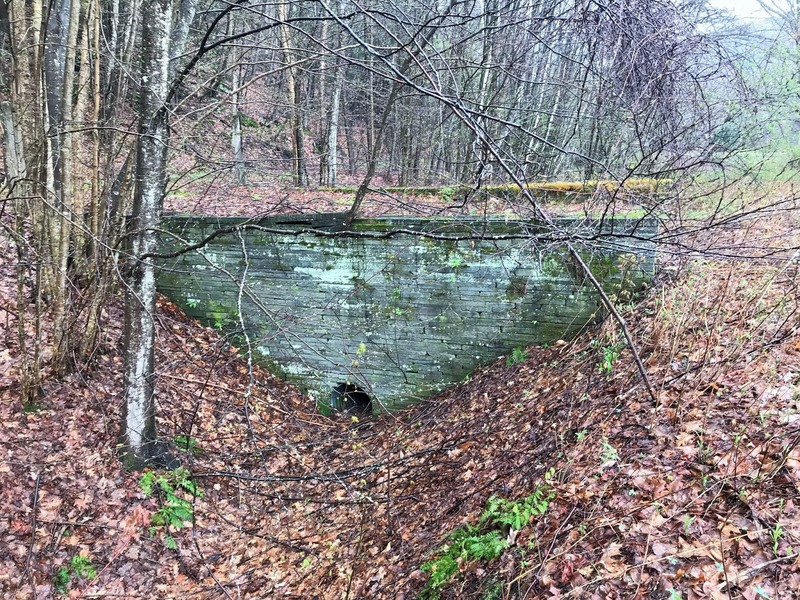 Although the hatch was waning, there were enough to elicit takes, thus I had enough targets to keep things interesting. I took 6 more trout, all on the same soft hackle emerger fished in the film. 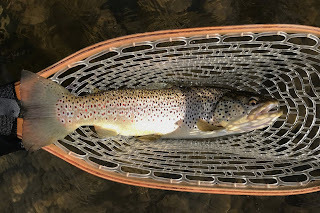 My leader was 12-13 feet long, with the tippet being about 3 feet of 5X, and even without wading over my ankles (which helps a lot on this river), none of my casts were over 30 feet or so.